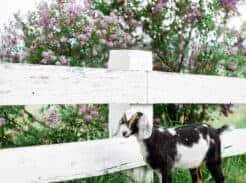 Farmhouse Home decor from ikea. 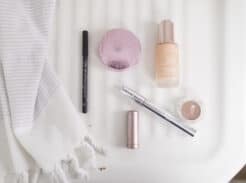 Get my list of the best finds. The St. Louis IKEA just opened its doors a little over a year ago, and I have already made the hour long trek to the superstore at least 10 times. What kind of items am I loading into the van and hauling back to ye old Farmhouse on Boone? I’m so glad you asked! I like to make pillow covers. I think you probably know that by now. IKEA has their 20″ pillow forms, which I find to the perfect size for most of the throw pillows in my house, for only five bucks. I usually pick up a couple when I go. They also have beautiful pillow covers. The white pillow on my bed is the 16″ by 26″ VITFJARIL cushion cover. 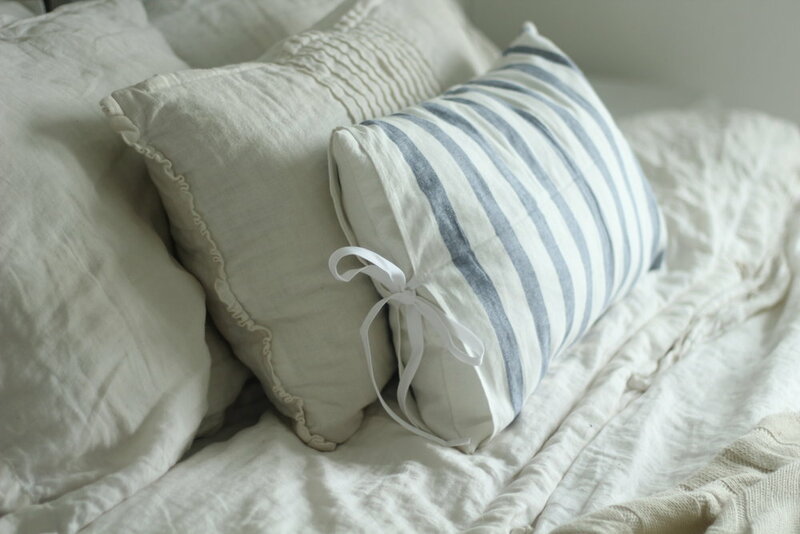 The grain sack and ticking stripe pillow covers can be found in my shop here. 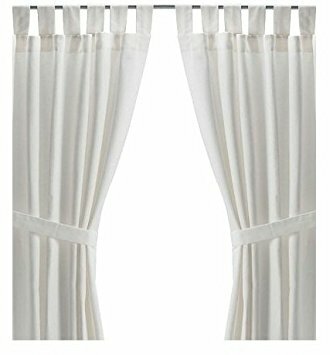 I have five pairs of the IKEA Lenda curtain panels. I guess you could say I love them. They are the perfect weight, not too sheer but allow light in, super long and CHEAP. I have three of the white sets in my living room and the natural color in my loft upstairs. I like to sew, don’t get me wrong, but I would probably pay at least double for the heavy upholstery fabric, than what these cost already made. 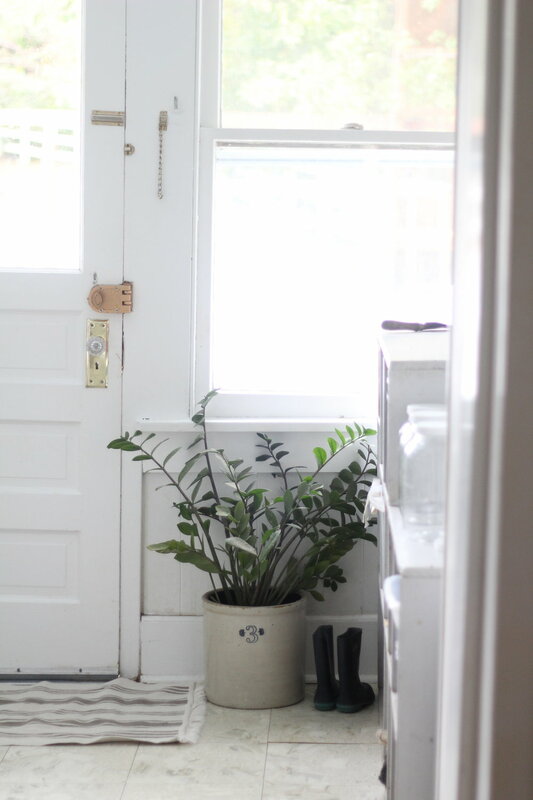 Everyone has the FEJKA artificial plants from IKEA, but that’s because they’re awesome. They are only $3.99 and they look real. Win. The Mr. and Mrs. Grain Sack Pillow Covers can be found in my shop here. 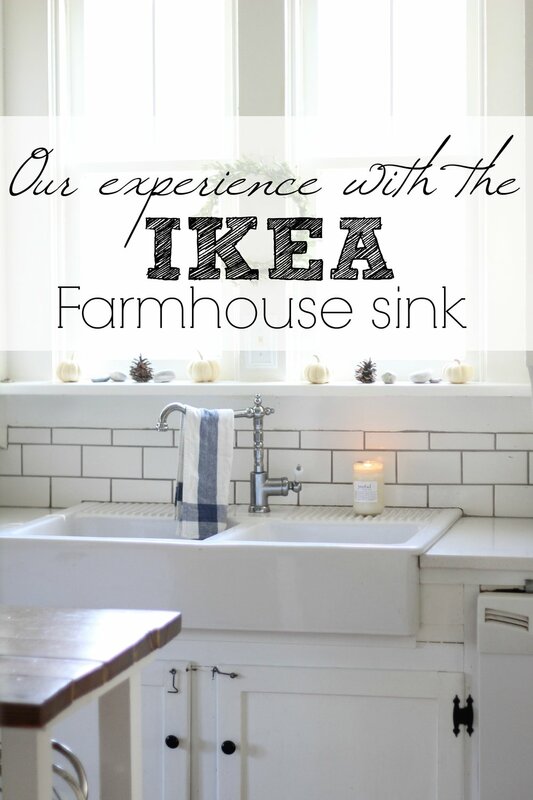 I purchased the IKEA Domsjo farmhouse sink shortly after the St. Louis location opened. It is huge, heavy and super easy to keep clean. I actually plan to write a full review in the near future. I selected the Glittran faucet. I was a little nervous about not having a sprayer, but I honestly haven’t missed it at all. 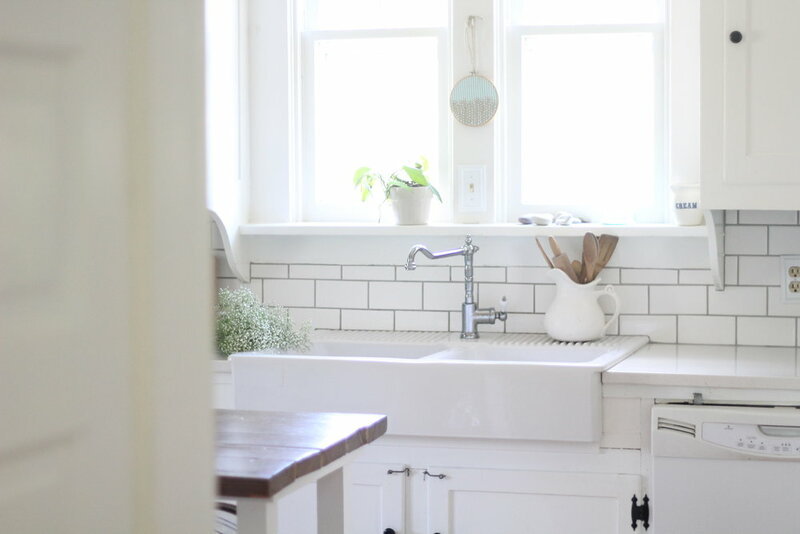 I wrote a full review of my sink in this post. IKEA has the most gorgeous linens. I seriously purchase tea towels every time I go. 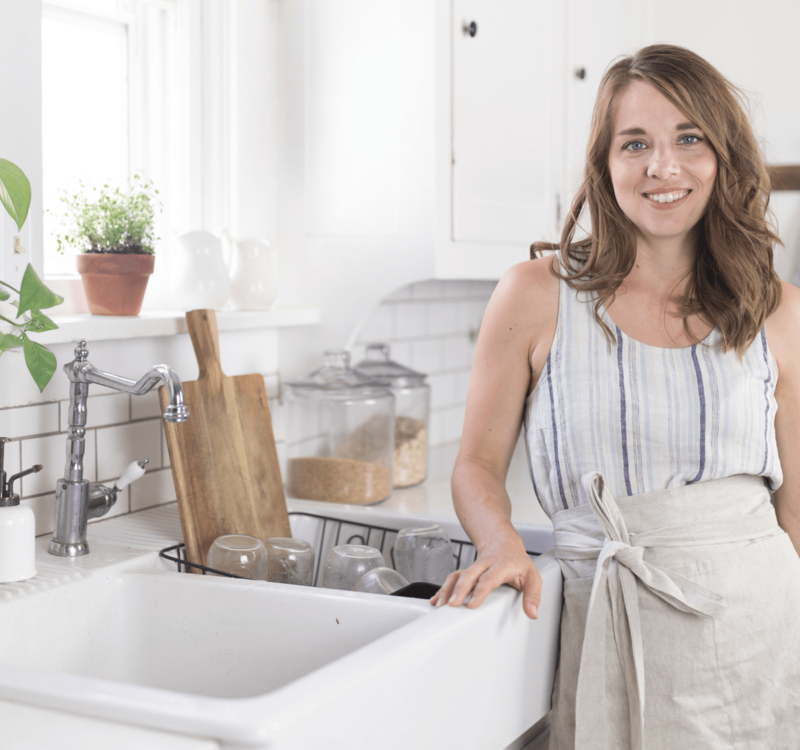 The ELLY Dish towel set is my absolute favorite and sells for $3.99 for a 4 pack. I use them instead of dish rags in my kitchen. Since they are light weight they dry faster and don’t stink. 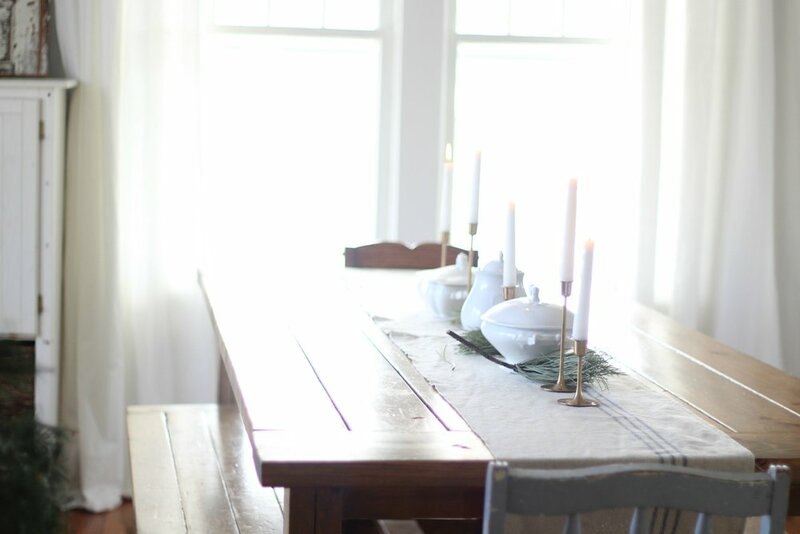 I even made some Simple Farmhouse Pillows and a harvest apron with my favorite IKEA tea towels. I also bought the LINBLOMMA linen duvet bedding set for our master bedroom. I love the little ties on the pillows and duvet. 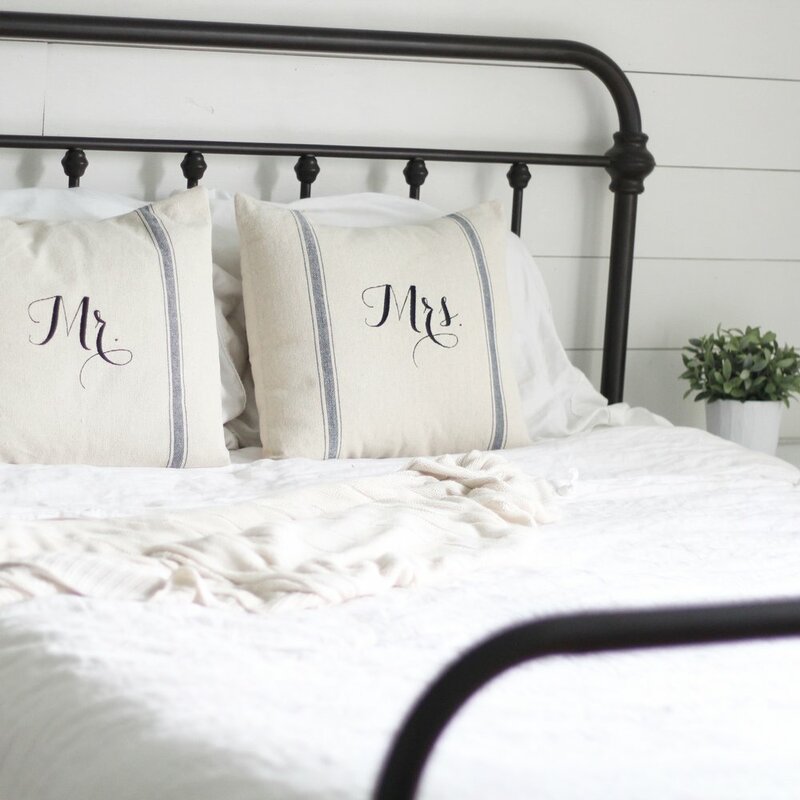 The fabric is high quality and looks nice on our iron bed. 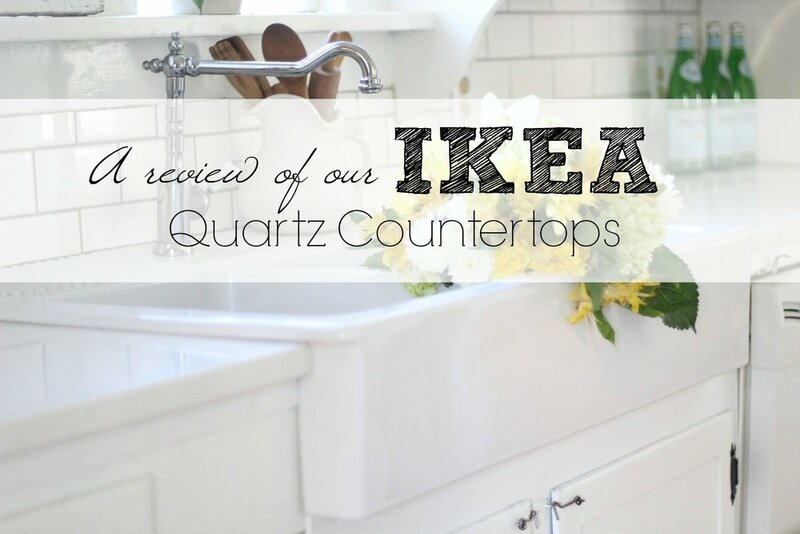 Our white quartz countertops, that were installed last winter during our kitchen remodel, came from IKEA. I wrote a full review on them in my last post. IKEA has some great rugs for some great prices. I bought the woven SIGNE rug in my mud room there for $3.99! It gets so dirty, but it has help up through multiple washes. I think I need several more for that price! They also have a great price on their LOHALS Jute rug. 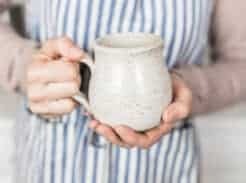 Although I don’t have any (yet), I know IKEA sells some gorgeous white pitchers and inexpensive picture frames. They also are pretty famous for their light fixtures and organizational items. 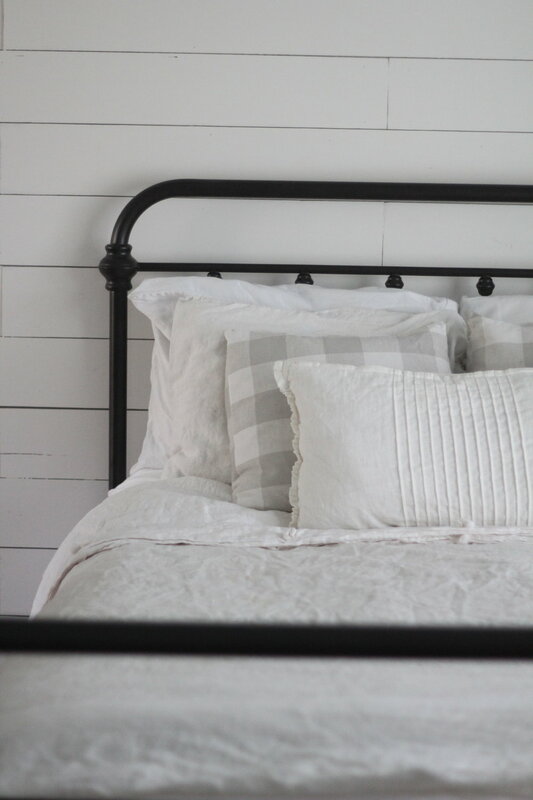 Although our iron bed isn’t actually from IKEA, their KOPARDAL bed frame has a very similar farmhouse look! Do you love IKEA too? What are some items you have to snag when you go? 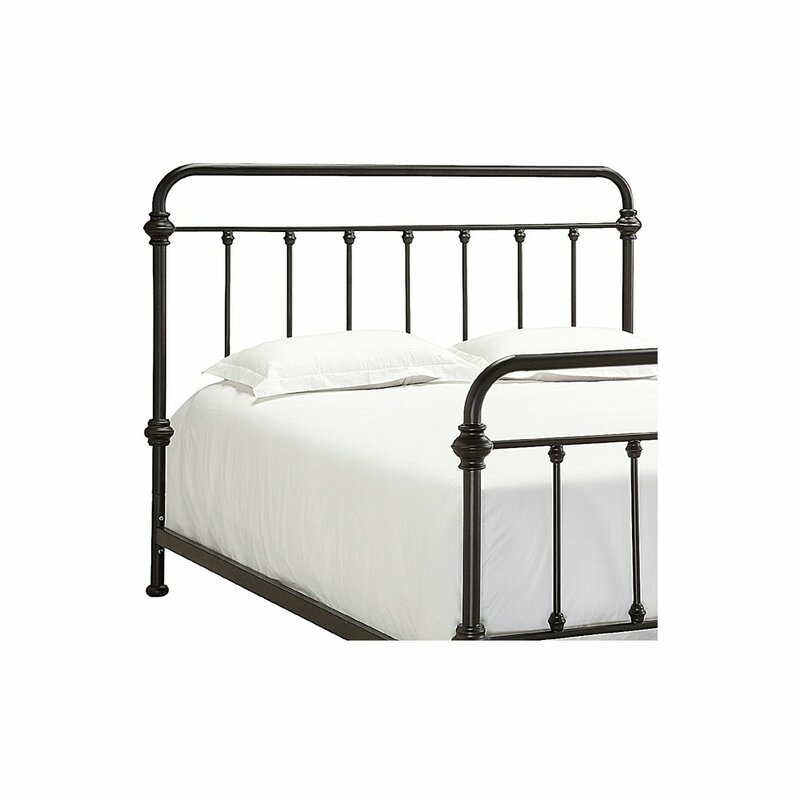 It is the antique bronze metal bed from Target. I hope to write a review on it very soon, but *spoiler alert* we love it! You will love it I’m sure! 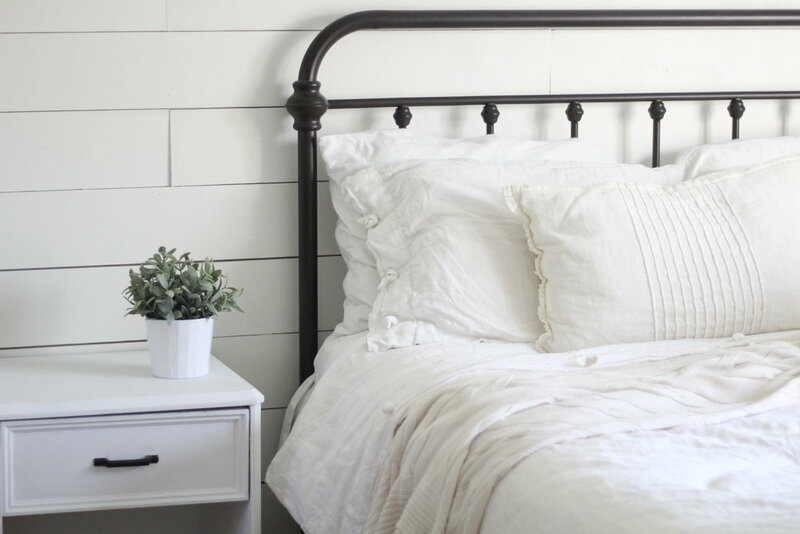 Is your IKEA duvet the white or natural? It is the linen one. Right now we live about 20 minutes from the St. Louis IKEA. We’re moving next week to Mid-MO and will be 2 hours away. WAH!!! I looked at the linen duvet set today. 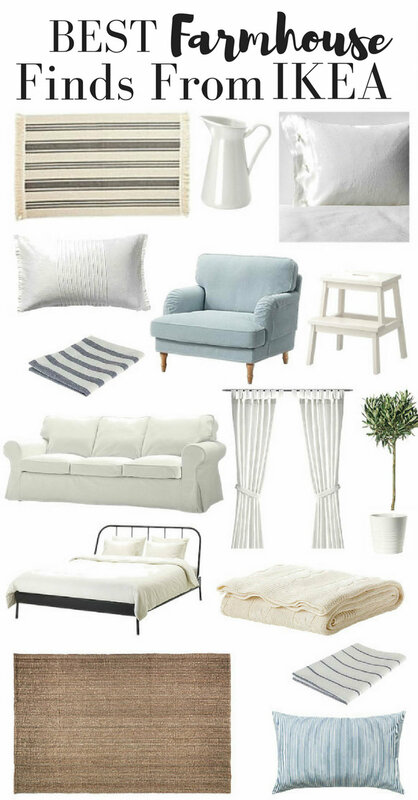 I can’t decide between the set from IKEA or the Fieldcrest set from Target. Decisions, decisions. 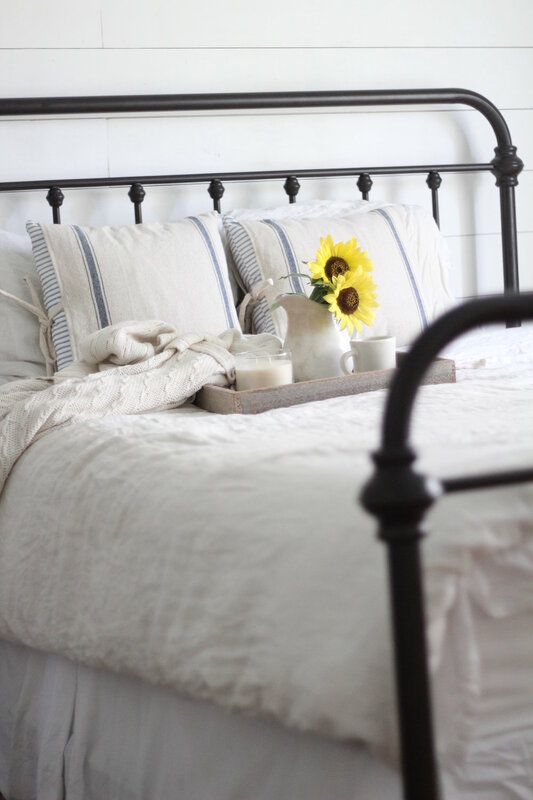 Where is your awesome iron bed from? I need one for my guest room! I have bought their linens also, 2 of their farmy pitchers, white dishes set x 2, duvet cover that looks like old fashioned ticking. 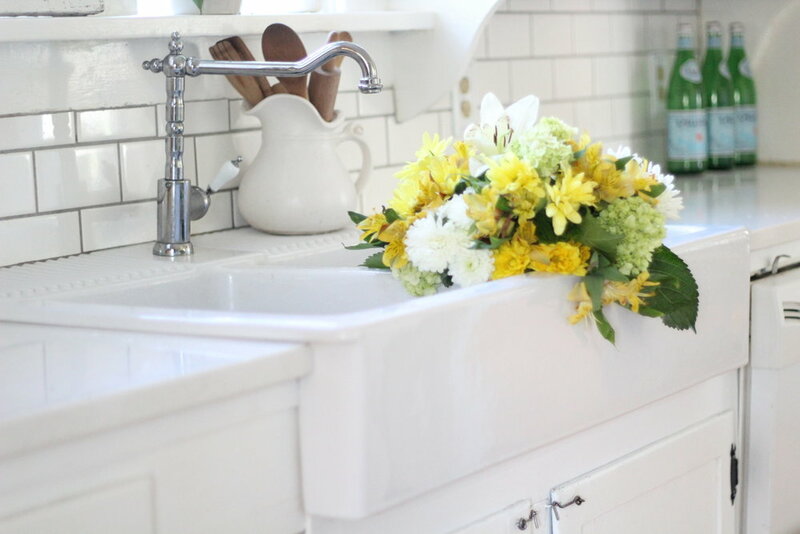 We did our master bathroom remodel with their items here- http://littlehomesteadinboise.blogspot.com/2014/05/bathroom-remodel-reveal-finally-fun-diy.html, with counter top/sink, cabinet, faucet, shower curtain. 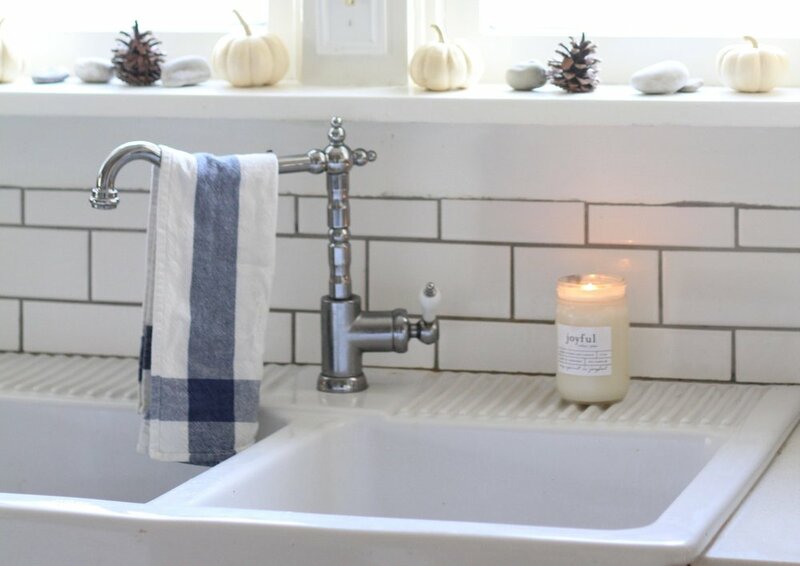 We added their apple green bath towels later. I wish we had one in Boise! Have to wait til we go to Portland to shop. Bathroom has held up great! They also have great foods! Love their unusual Swedish cheeses and Lingon berries!!! Yes! We get the meatballs every time we go, and I love the lignon berries! Sounds like you love IKEA as much as I do!! 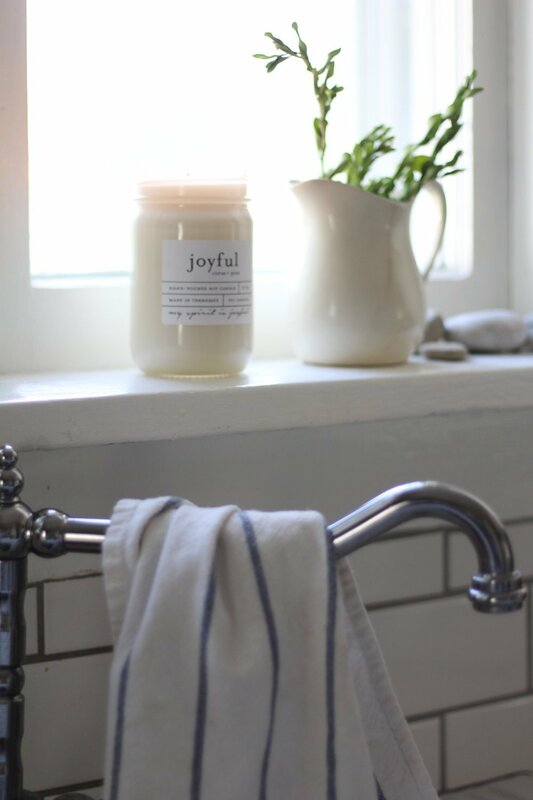 May I ask where your "joyful" candle is from? 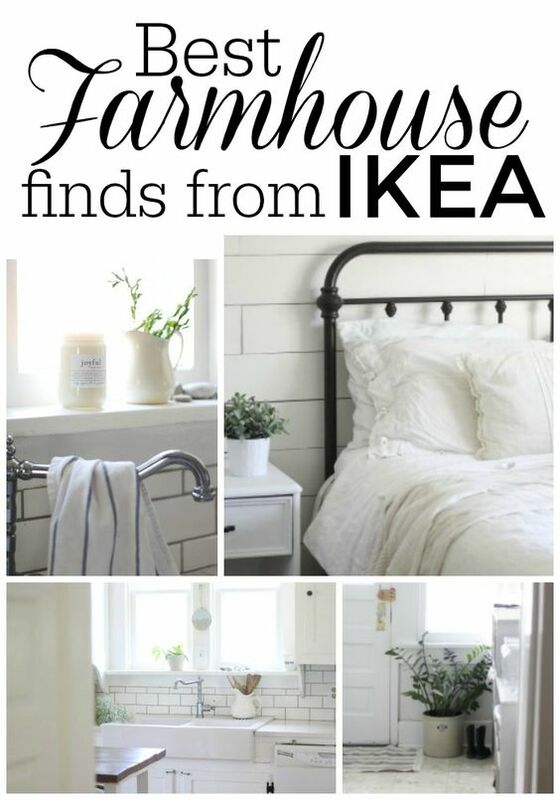 Love all your decor types… IKEA is so great for that clean/farmhouse look! Thank you so much Roxana! What do they call that pillow from Ikea that has the lines in the front… I’m trying to find it. I also noticed it on another farmhouse I’m following. : ) must have! I love the bedskirt you used. Did you make it or purchase it?